From the Department of Neurology (Drs. Wszolek, Tsuboi, and Uitti, and A.J. Strongosky) and the Department of Neuroscience (Drs. Farrer and Dickson), Mayo Clinic, Jacksonville, FL; the Department of Neurology (Dr. Pfeiffer), University of Tennessee Health Science Center, Memphis, TN; the Department of Pathology and Microbiology (Dr. McComb), University of Nebraska Medical Center, Omaha, NE; the Department of Neurology (Dr. Stoessl), University of British Columbia, Vancouver, British Columbia, Canada; the Department of Neurology (Drs. Zimprich and Gasser), Klinikum Grosshadern, Ludwig-Maximilians-Universitie, Munich, Germany; the Computational Genetics Group (Dr. Müller-Myhsok), Max-Planck-Institute of Psychiatry, Munich, Germany; and the Pacific Parkinson’s Research Centre (Dr. Calne), University Hospital, Vancouver, British Columbia, Canada. Since the original 1995 report of a parkinsonian kindred, four individuals have been affected (mean age at onset, 65 years). All four had cardinal signs of Parkinson disease (PD) and good response to levodopa. Four autopsies showed neuronal loss and gliosis in the substantia nigra. Lewy bodies (LB) limited to brainstem nuclei were detected in one case, diffuse LB in the second, neurofibrillary tangles (NFT) without LB in the third, and neither NFT nor LB in the fourth. Genetic studies suggested linkage to the PARK8 locus on chromosome 12. Since 1992, we have followed a parkinsonian kindred, Family D, also called the Western Nebraska kindred.1 Phenotype is characterized by late-onset, levodopa-responsive parkinsonism. Since our initial report in 1995, we have added 8-year follow-up information on this family, during which progress was made in clinical, pathologic, and genetic investigations. Family D pedigree has 190 members, with 22 affected (figure 1). Eighteen affected members were included in the previous report1; four (III-24, IV-5, IV-15, and IV-24) were affected in the interim. Family D is most likely of English extraction and genealogically unrelated to kindreds known to others and us in the United Kingdom (D. Nicholl, personal communication, April 2003). Figure 1. Pedigree of Family D (western Nebraska). Squares represent males, circles represent females. Solid squares or circles represent affected subjects. A diagonal line through a square or a circle indicates a deceased person. An arrow indicates proband. A plus sign indicates the presence of mild postural and action tremor without any other symptoms or signs of parkinsonism. (III-10 was repeatedly examined during 5 years before his death at age 92 in 1998. III-9 died of heart attack at age 78 in 1979, before initiation of our studies on this family in 1992, and information about her is based on newly available medical and historical records; although she did not have parkinsonian features, typical parkinsonism developed in one of her daughters, IV-5.) An asterisk indicates the presence of supranuclear gaze palsy (vertical gaze palsy developed in III-21 at age 83 years, 5 years from the onset of symptoms, no other atypical clinical features were documented, and a good response to carbidopa-levodopa therapy was sustained). A caret indicates an autopsy. In the four newly diagnosed cases, symptoms developed at a mean age of 70.5 years (mean for all 22 affected, 65 years). Mean survival is 13 years in all affected members. The most common initial presentation includes bradykinesia (64%) and unilateral resting hand tremor (43%). Response to levodopa therapy has been excellent, and typical motor complications have developed in half those receiving treatment. During the study period, five family members died. Three (III-20, III-21, and IV-20) donated their brains for research; we retrieved glass slides and paraffin-embedded blocks from an autopsy of a fourth (III-14). All four patients had typical parkinsonism, and one (III-21) had a supranuclear gaze palsy (SNGP). Three of the four were alive after development of levodopa and had beneficial responses to treatment. Pathologic examinations (table) were made independently by two neuropathologists. Pathologic examination showed neuronal loss (NL) and gliosis with abundant extracellular pigment in the substantia nigra (SN). 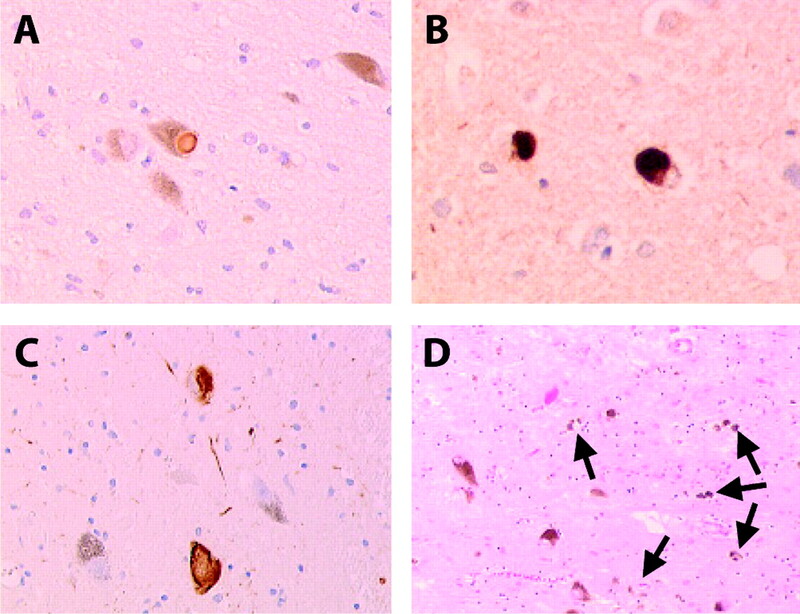 Lewy bodies (LB) and Lewy neurites were seen in the brainstem, whereas no neurofibrillary tangles (NFT), senile plaques (SP), or amyloid deposits were identified (figure 2A). The final pathologic diagnosis was brainstem LB disease (LBD). Figure 2. Pathologic features in four cases from Family D. (A) III-14. Brainstem-type Lewy body in substantia nigra. (Antibody to α-synuclein.) (B) III-20. Cortical-type Lewy body in insula cortex. (Antibody to α-synuclein.) (C) III-21. Neurofibrillary tangle and neuropil threads in substantia nigra. (Antibody to tau [CP 13].) (D) IV-20. Extracellular pigmentation in substantia nigra (arrows). (Hematoxylin-eosin.) Antibodies to tau (CP 13, diluted 1:100, recognizing phospho-epitope on tau at Ser202, obtained from Peter Davies, PhD, Albert Einstein College of Medicine, Bronx, NY) and to α-synuclein with a rabbit polyclonal antibody (1:2,000) or LB 509 mouse monoclonal antibody (1:100, Zymed Laboratories, South San Francisco, CA). There was nearly total loss of pigmentation of the SN and locus ceruleus (LC) in conjunction with marked NL and gliosis with extraneuronal melanin. SP were seen in frontal, temporal, parietal, and entorhinal cortices and in amygdala and hippocampus. NFT were seen only in the subthalamic nucleus, midbrain tectum, and pontine tegmentum. Immunohistochemical evaluation showed LB and Lewy neurites (figure 2B). The final pathologic diagnosis was diffuse LBD. The SN and LC showed decreased pigmentation with NL, gliosis, and extraneuronal melanin being most pronounced in ventral and lateral locations. NFT and a few tau-positive glia were present in the basal forebrain, striatum, subthalamic nucleus, and brainstem nuclei (figure 2C). Only a few cortical SP, but no LB or Lewy neurites, were found in any part of the brain. The final pathologic diagnosis was parkinsonism due to tauopathy. Mild cortical atrophy and ventricular dilatation were seen. There was nearly total loss of pigmentation in the SN and LC. Microscopically, the SN showed marked NL and gliosis, with extraneuronal melanin (figure 2D). No SP or NFT were seen. Immunohistochemistry showed no LB or Lewy neurites in any part of the brain. The final pathologic diagnosis was parkinsonism due to nigral degeneration without any distinctive histopathologic finding. NL and gliosis were present in the SN of all individuals. LB were found in only two of the four and tau pathology in one of the four. The latter patient had clinical signs of SNGP, but the density and distribution of lesions were not compatible with progressive supranuclear palsy (PSP). Genetic analyses were performed in 33 Family D members (9 affected). Linkage studies supported linkage to the PARK8 locus on chromosome 12; the multipoint logarithm of odds (lod) score was 1.67 (p = 0.0028). Penetrance-dependent model showed the multipoint lod score of 2.24 (p = 0.0007). A common haplotype was identified segregating through the pedigree, support for linkage was between D12S291 and D12S1701, and the maximum score was at D12S85. Pathology of III-21 was most unusual—no LB but rather tau pathology. Neurofibrillary degeneration is a hallmark of PSP and corticobasal degeneration. Other examples of similar pathology with typical levodopa-responsive clinical features also have been described in sporadic PD cases.4 III-21 had SNGP, but there were no other features of PSP. IV-20 had only nigral degeneration. Such pathology occasionally is found in otherwise typical sporadic PD and is the usual finding in PARK2 kindreds with mutations in the parkin gene. Classification of familial parkinsonism and assessment of its relationship to sporadic PD are challenging. A review of familial parkinsonism was published recently.5 Families with α-synuclein and UCH-L1 mutations have earlier symptomatic disease onset and shorter disease duration than Family D. Autopsy findings from one affected member of the largest α-synuclein-linked family, the Contursi kindred, showed LB stained with both α-synuclein and tau antibodies.6 Phenotype of families with tau mutations classified as frontotemporal dementia and parkinsonism linked to chromosome 17 (FTDP-17) is heterogeneous and different from that of Family D. Even the Family D patient with SNGP would not fit the picture of FTDP-17. Pathologically, widespread neuronal and glial tau lesions are found, but no LB have been identified in FTDP-17,7 presenting a different picture from that in Family D.
Families with parkin mutations have an autosomal recessive mode of inheritance, early onset of symptoms, and no LB or tau pathology. There are exceptions, however, both synucleinopathy and tauopathy being described.8 The autopsy findings of IV-20 showed nigral degeneration without distinctive histopathology, similar to the pathology frequently described in PARK2 cases. Our genetic investigations support linkage to chromosome 12, with a maximal two-point lod score of 2.24, evidence that the disease gene in Family D maps to the PARK8 locus. The Sagamihara family is the first kindred linked to PARK8.2 Gene defect and product are not known. Phenotype is characterized by late-onset and slowly progressive parkinsonism. Pathologic studies in four cases showed “pure nigral degeneration without any type of inclusion body” (similar to IV-20). Clinical features and good response to levodopa are similar to those of Family D.
Supported in part by the National Institutes of Health, the National Institute of Neurologic Disorders and Stroke, the M. K. Udall Parkinson’s Disease Research Center of Excellence grant, the Canadian Institutes for Health Research, and the Pacific Parkinson’s Research Institute. T.G. and A.Z. were also supported in part by the Deutsche Forschungsgemeinschaft (Ga 402/9-1) and the Bundesministerium für Forschung und Bildung (BMBF, Grant No. 01GS0116). The authors thank the members of Family D for their interest and cooperation throughout this study. Presented in part at the 7th International Congress of Parkinson’s Disease and Movement Disorders; Miami, Florida; November 10 to 14, 2002 and at the 55th annual meeting of the American Academy of Neurology; Honolulu, Hawaii; March 29 to April 15, 2003. Accepted in final form December 23, 2003. Wszolek ZK, Pfeiffer B, Fulgham JR, et al. Western Nebraska family (family D) with autosomal dominant parkinsonism. Neurology. 1995; 45: 502–505. Funayama M, Hasegawa K, Kowa H, Saito M, Tsuji S, Obata F. A new locus for Parkinson’s disease (PARK8) maps to chromosome 12p11.2-q13.1. Ann Neurol. 2002; 51: 296–301. McKeith IG, Galasko D, Kosaka K, et al. Consensus guidelines for the clinical and pathologic diagnosis of dementia with Lewy bodies (DLB): report of the consortium on DLB international workshop. Neurology. 1996; 47: 1113–1124. Rajput AH, Uitti RJ, Sudhakar S, Rozdilsky B. Parkinsonism and neurofibrillary tangle pathology in pigmented nuclei. Ann Neurol. 1989; 25: 602–606. Hardy J, Cookson MR, Singleton A. Genes and parkinsonism. Lancet Neurol. 2003; 2: 221–228. Duda JE, Giasson BI, Mabon ME, et al. Concurrence of alpha-synuclein and tau brain pathology in the Contursi kindred. Acta Neuropathol (Berl). 2002; 104: 7–11. Reed LA, Wszolek ZK, Hutton M. Phenotypic correlations in FTDP-17. Neurobiol Aging. 2001; 22: 89–107. Farrer M, Chan P, Chen R, et al. Lewy bodies and parkinsonism in families with parkin mutations. Ann Neurol. 2001; 50: 293–300. Zimprich A, Müller-Myhsok B, Farrer M, et al. The PARK8-locus in autosomal dominant parkinsonism: confirmation of linkage and further delineation of the disease containing interval. Am J Hum Genet. 2004; 74: 11–19.